This package tour gives to you an advantage of a sightseeing and visiting two very interesting tourist attractions of the city – the State Hermitage and the Yusupov Palace. During the driving part of the tour you will visit some beautiful places of Saint-Petersburg and Peter-and-Paul Fortress and then, have excursions to two beautiful palaces. 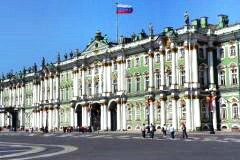 Hermitage (also known as the Winter Palace) was the home for the russian tsar’s for two centuries, it’s art collections boast to be one of the largest in the world. The Yusupov Palace has rich and beatiful interiors. You will know the history of the Yusupov Dukes and the story of the murder of Grigory Rasputin.